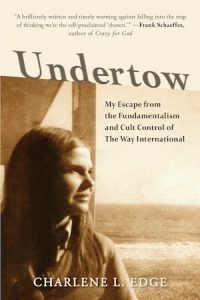 In her award-winning book Undertow, Charlene Edge dissects her past as a long-time member of one of the largest fundamentalist cults in the United States, “The Way International.” Undertow is a demonstration of the dangers of fundamentalism and the destructive nature of cults. Through her personal story, Charlene Edge shows how a vulnerable person can be seduced into following an authoritarian leader and how difficult it can be to find a way out. Charlene’s experiences with “The Way” depicts the downward spiraling of a college student who – for reasons all her own – fell for a certain kind of propaganda. Now, if it happened to her, why not to you? To us? Maria Moss: What do you think made you – a beautiful, intelligent college student – so vulnerable to a cultish organization like “The Way”? Charlene L. Edge: First, thanks for the compliments, but I always remind people that given the right circumstances, anyone can be vulnerable to persuasive recruiters from high-control groups – often called cults – that promise spiritual enlightenment, Bible knowledge, self-improvement, or political power. I say this because humans seek to make meaning in their lives. Much of American society, for example, is structured around Christianity, so it seems natural for a large part of our population to seek meaning through that religion. In my case, I think several things contributed to my vulnerability to The Way. Most of all, I was looking for what the group offered: Bible knowledge and Christian fellowship. When Way believers recruited me, flashing lights went off! They were college students like me, but they sincerely believed in the goodness of their group’s intentions to help people understand God’s teachings. They were also trained in overcoming objections to their fundamentalist approach and perspective. For example, The Way believes that the only way to know God and have a robust relationship with Him is through an ‘accurate’ knowledge of the Bible. To convey the group’s alleged ability to teach ‘the accurate Word of God’ in the classes they sell, they attempt to prove, for example, that the Gospels – when harmonized – show that there were not two, but actually four men crucified with Jesus. Then, since The Way supposedly demonstrated a superior understanding of the Bible, the only way to have that alleged robust relationship with God was to take more and more of their classes and commit to regular and frequent fellowship meetings with them. They claimed to be and sounded very certain that their Bible class, “Power for Abundant Living,” would answer all my questions. At the time, however, because I was so young and had so little life experience and little understanding of the Bible, I was not wise enough to effectively challenge their claim that their teacher, Victor Paul Wierwille, taught ‘the accuracy of God’s Word.’ In fact, because of the social and emotional realities of my life at the time, I didn’t even realize I should challenge those claims. They presented The Way as a reputable, organized biblical research, teaching, and fellowship ministry. I bought into it because it sounded special and they made me feel special. In addition, Wierwille seemed to have good credentials, i.e. a degree from a seminary and experience as a former church pastor. More important to thousands of us was his claim to have received special revelation from God. I was hooked. But I want to explain a little more about why I was a prime target (I tell this story in-depth in my book, Undertow.) In high school, I’d been born again in an evangelical youth group called “Young Life” where leaders convinced me I needed to find more Bible knowledge and Christian fellowship. Boom. The night I met Way recruiters on my college campus, their enthusiasm infected me like a virus. Their personal testimonies, overwhelming attention, and conviction about knowing the ways of God were irresistible. Lastly, I think the most important thing to know about why I was vulnerable is this: I became 100 % sure that God was directing my life behind-the-scenes, and that He had brought Way believers to me in answer to my prayers. MM: In your book you mention ‘speaking in tongues’ – could you please explain how that works? CLE: The phenomenon called ‘speak in tongues’ is mentioned in the Bible. Many Christians believe it started on the Day of Pentecost with the Apostles. There’s a record in Acts 2:4 that says, “And they were all filled with the Holy Ghost, and began to speak with other tongues, as the Spirit gave them utterance.” In The Way, Wierwille taught that any born-again Christian could do what the Apostles did. He attempted to teach us how to speak in tongues, directing us to close our eyes, pray, relax, breathe deeply, and ask God to fill us to overflowing with the Holy Spirit. We were supposed to speak any words that came to us, one after another, until we were speaking what sounded like real sentences, only they would be in a language we’d never learned. I know this may sound strange to outsiders, but this phenomenon is described by other groups, too, such as Pentecostal Christians. When they speak in tongues, in some of those churches, they fall on the floor, shouting strange words uncontrollably. In The Way, we didn’t roll around on the floor, but would sit calmly and do it quietly. Please check in next week for Part II. After spending seventeen years with “The Way International,” Charlene L. Edge earned a B.A. in English from Rollins College and became a published poet and prose writer. She is a memer of the Florida Writers Association and the Authors Guild. This year, the Florida Authors and Publishers Association awarded the gold medal to Charlene’s memoir, Undertow, in the category of Autobiography/Memoir.